Have used their services for over 10 years and are very pleased. NO BUGS! Thank you Kathy for taking the time to share your thoughts. Love Masters. I will be using them on my new house. I also suggest them to like a million people. Thank you Patrick for taking the time to write such a kind review. We appreciate all the referrals. excellent communication and prompt courteous service. Thank you Pat for your confidence in Masters Pest Control and for taking the time to write such a kind review. Excellent service. Always professional, and friendly. Always a great job. Thanks! Thank you for taking the time to share your thoughts about our service. very much appreciated. They are polite and do a great job. Thank you Ruth for taking the time to write such a nice review. A staff of Professionals who are knowledgeable, and respectful. And always available to answer questions. Greetings Mike, Thank you for taking the time to share your thought with others. Your kind words are much appreciated. Not sure if this is going to work or not, as today was the first day of treatment for tiny ants. The bait is working because there are many many ants on top of the bait. I believe that this is a good sign. We shall see. Greetings Christine, and thank you for posting your thoughts. I can appreciate your uncertainty. Treating for small ants often requires patience and a determined effort. There are 2 things to remember: 1. Never use over the counter products on small ants. There is a real good possibility it will only make it worse. Baiting is slow, but they will bring the bait back to the nest killing them where they live. OTC products will kill some, but these products have a tendency to scatter the ants to multiple new locations where the breeding cycle will begin again. Now instead of maybe one nest, you have multiple nests. 2. You have us. If you have a question or concern you can always give us a call. Our office staff is very knowledgeable and can often address many of your questions over the phone. If they can't answer your questions or address your concerns you have me. Thank you for choosing Masters Pest Control. Great job! Very courteous and professional! Thank you Vito for taking the time to share your thoughts. We were able to schedule an appointment quickly and they were prompt and provided great service. Very personable and efficient. Took care of everything and went beyond expectations. Thanks! Always a pleasure to deal with and great service. Thank you Alan for your kind review. I was very happy with Masters Pest Control. I was able to get an appointment the next day, they came exactly at the time given and provided me with several different options and price ranges to choose from. Their customer service and professionalism was above what I expected. I will definitely be using them for any issues in the future. Thank you for taking the time to share such a kind review. Please know that we are here for you if you have any questions or concerns. The inspection was done promptly. Always supportive wether I am near or far. Thank you! Thank you for taking the time to write such a kind review. Our goal is to be "that" company you can rely on. Again, Thank You. Satisfied with the service. Would be great if you had some sort infrared technology, to get a better understanding of what’s behind walls and so forth. Masters Pest Control went the extra mile. Did a thorough job and was very willing to explain what they are looking for and why. This helps the client to better understand the process. Very professional and courteous. I highly recommend Masters Pest Control. I think our mouse problem is finally under control and I am very happy!! Always professional, punctual, and super friendly! Fair pricing and very helpful staff. Many thanks for taking the time to share such a nice review. Your comments are much appreciated. These guys are professional and reasonable and we recommend them highly! Thank you Ron for taking the time to share such a kind review. Your services were utilized for a home purchase inspection. They were fast,thorough and reporting was timely. If I ever get buggy,(and I hope I dont), I'll call you folks first! Excellent customer service. Always on time for appointments, clearly explain work being done, very nice staff and competent technicians. Thank you for taking the time to write such a kind review. It means a lot to us back here. Very knowledgeable and efficient staff. I have been using Masters for years now. Very reliable and professional. The owner Bob is great! Thank you for the peace of mind I have with you and your company! Wonderful service!!! We would not want to be without you. Thank you for the kind words. We would not be here without you. Very professional & accommodating when called. Always pleasant & friendly. All of the ladies in the office are very helpful and very nice to talk to. When Donny comes to my house he always does a good job and he is polite. Thank you for the great service. Sincerely Gigi Catizone. Thank you for sharing your thoughts and taking the time to write such a nice review. We all appreciate your kind words. Very pleased the time you said was right on and the price was right. Always great service, prompt response and good people. Courteous techs and office staff,prompt service and any concerns addressed quickly. 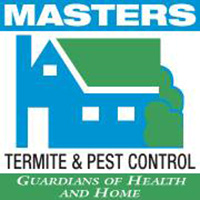 We can’t thank Masters Pest Control enough! Our home inspection was so thorough and Bob did an amazing job finding a problem that needed attention. It was taken care of and we are good to go! When we close on our home we will be sure to be contacting Masters for a full service contract so we don’t ever have to worry about a problem again. Thank you guys! Thank you for taking the time to write such a kind review. Be sure to contact us if you have any questions or concerns and remember we're here for you. Excellent & thorough job. Would highly recommend their service. We finally met our agent. He was very polite and explained about the technique he had used on the previous visit to tackle the carpenter ants that had been all over the place, and soon after the treatment were gone. Thank you for taking the time to write such a nice review and sharing your thoughts, and thank you for your years of continued confidence and patronage.